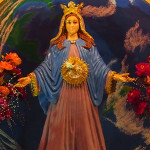 Mother Mary appeared in very brilliant light dressed in white, at the ‘grotto’ at the home of the Visionary, in the 2nd Sorrowful Mystery, in the 5th Hail Mary and the apparition took 38min. Receive a blessing that comes from all My heart. This is the most serious message that I’m going to offer you from all My heart. It is better for you to be warned than to receive a bitter surprise. The world will be shaken; many places will disappear, and they will no longer exist. Many of you don’t give each other value until one of you pass away – than it’s too late. Don’t delay in converting and don’t let others go ahead of you. Make sure you are a chosen one to go to heaven. Many are called but a few are chosen to work for My Son Jesus. The world will be attacked spiritually. Don’t scream, don’t yell at each other to hurt each and make each other feel badly to repent the next day asking forgiveness and remaining hurt. For this don’t do things in a hurry without thinking. Let the Holy Spirit lighten your life every day, showing you what’s good and what’s bad, because there’s an ongoing increase in many negative things. Open your eyes and your hearts so you can be warned before it’s too late. Always confess before taking the Holy Communion, because the bread and wine will become the body and blood of My Son Jesus. Many of you love only with words, but not from a true heart. Some of you pray to get something you’re asking My Son Jesus immediately. You don’t go to Mass for love, but you go to Mass only to receive help. When some of you receive assistance, you leave the Visionary and the prayers. My children grow in faith and turn your backs to evil. Consecrate your family before it’s late and grow spiritually to help each other with love. Help those who need help. For example, pray for the sick, for the lonely, visit the elderly, try to convert those who are in the dark, talk about forgiveness so you they can start a new life and go forward, because the time is short. Come and walk together on the good path so you can all succeed. Come closer to Me and to My Son Jesus. Don’t live every day hurting, because hurt and loneliness can end you. Remain every day active in prayer so the day can pass by. Sing and pray. Speak everywhere about My Son Jesus, that He can do miracles and that He is everywhere. My children, My Son Jesus watches over you everywhere and He sees everything. Thank you for listening to My message. I give you a blessing that comes from all My heart. I wish you strength to continue in this effort. Your Mother, the Virgin of Grace of Aruba who love you for eternity.